New York Film Academy (NYFA) Celebrates Winners at the 70th Primetime Emmy Awards! The New York Film Academy (NYFA) Community had a lot to celebrate while watching the 70th Primetime Emmy Awards on Monday, September 17. 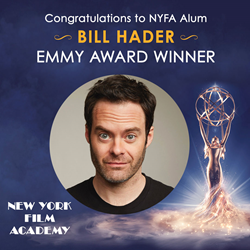 One of the big winners of the night was HBO’s new comedy, Barry, starring Bill Hader, a NYFA workshop alum, and Henry Winkler, who both received acting Emmys. Henry Winkler was a guest speaker at the Los Angeles campus (you can listen to his guest speaker event on the NYFA Podcast, The Backlot). Other members of the NYFA community involved with this year’s Emmy Awards include Emmy-nominated alum Issa Rae (Insecure) and alum Francesco Panzieri, who has worked on Emmy-nominated Westworld. Additionally, Netflix’s critical and commercial hit Stranger Things was up for several nominations. The nostalgic horror’s cast includes alum Matty Cardarople and NYFA Board Member and Master Class Lecturer Matthew Modine, and the show’s iconic opening titles were in part designed by Emmy-winner and NYFA alum Eric Demeusy. Netflix made headlines when it broke HBO’s 17-year streak of most nominations, with 112 total, to HBO’s 108. This continues the cultural dominance in longform storytelling that started when COO Ted Sarandos, who spoke with NYFA students earlier this year, shepherded Netflix into the future of original content. The New York Film Academy congratulates all Emmy nominees and winners, including our Alumni and community for their success this year! The New York Film Academy (NYFA) is a leading visual and performing arts school that offers courses across 15 areas of study in New York City, Los Angeles, South Beach/Miami, Gold Coast (Australia), Florence (Italy), and more. Thousands of aspiring artists come to study at the New York Film Academy each year from over 120 countries. For more information, please visit nyfa.edu.